Promotional bum bags are appreciated and unique promotional items . Practical as travel accessories, branded waist bags and bum bags are always welcome as business travel gifts and perfect for give aways at your next event. They provide a convenient and secure way of carrying important travel items including passports, wallet and even mobile phones. 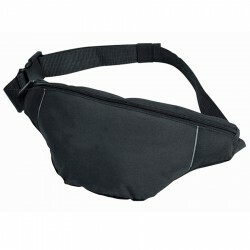 Promotional Product Experts line of promotional bum bags features a variety of style, colour and material. 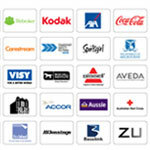 Simply have them printed with your brand name or logo and enjoy much exposure. 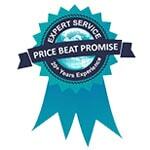 We offer the most competitive prices in Australia; contact us today to enjoy the best value for your budget! 210D & 600D textured non-woven polypropylene. Front zippered compartment. Ideal for travel. Perfect for holding small belongings. Fitness Waist Band Lightweight adjustable waist band with zippered closure. Two separate compartments to store your keys and electronics as well as earbud port for easy access. Waist bag with an adjustable 104 cm belt which is ideal for running, walking or at the gym. Has a large zippered front pocket, an internal key pocket and a slot for earbuds. 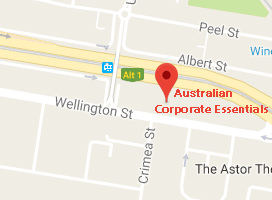 NOTE: A production lead time of 10-15 working days, plus shipping, applies to this product as this item is a product directly sourced from overseas. 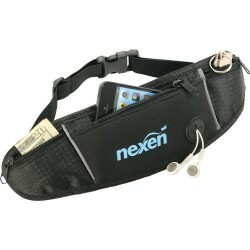 Neoprene waist bag with an adjustable elastic waist belt which is designed for running, walking or at the gym. Has a large zippered front pocket, two small side pockets and a built in slot for ear buds. NOTE: A production lead time of 10-15 working days, plus shipping, applies to this product as this item is a product directly sourced from overseas. 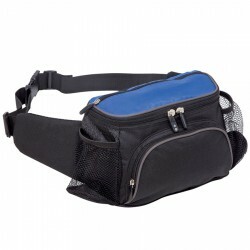 Low cost waist bag manufactured from 210D polyester with an adjustable 112 cm waist belt. NOTE: A production lead time of 10-15 working days, plus shipping, applies to this product as this item is a product directly sourced from overseas. Single compartment waist bag manufactured from 70D nylon with an adjustable 112 cm waist belt. NOTE: A production lead time of 10-15 working days, plus shipping, applies to this product as this item is a product directly sourced from overseas. Waist bag manufactured from 70D nylon which has an insulated water bottle holder. Has two external zippered pockets and a mesh pocket along with an adjustable 112 cm waist belt. NOTE: A production lead time of 10-15 working days, plus shipping, applies to this product as this item is a product directly sourced from overseas. Deluxe waist bag manufactured from coated 420D nylon, Has three zippered pockets and an adjustable 112 cm waist belt. NOTE: A production lead time of 10-15 working days, plus shipping, applies to this product as this item is a product directly sourced from overseas. 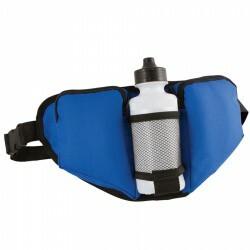 Insulated Sport Bottle Fanny Pack Zippered main compartment. Insulated water bottle pocket with cinch closure. Cable port for quick and easy access of ear buds. Adjustable waist strap. Earbuds and accessories not included. 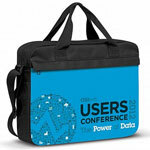 600D/300D polyester with PVC backing. Double zippered main compartment. Contrast panels Side release clip. Reflective piping stripes. Business card holder on rear. 600D polyester with PVC backing. Full size zippered valuables pocket at back. Mesh water bottle holder with elasticised top. 600ml bottle included. 2 front zippered pockets. Adjustable waist strap (to fit up to 125cm when fully extended). 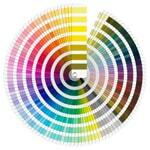 All colours have black trimming. Insulated bottle holder manufactured from laminated open cell foam. Has a belt loop, drawstring and a handy clip. NOTE: A production lead time of 10-15 working days, plus shipping, applies to this product as this item is a product directly sourced from overseas.